Last time I was in Hawaii I was on the island of Oahu just a few minutes from Waikiki Beach. Waikiki is like the mecca of all tourist attractions for people in Hawaii- they have cute little t-shirt stands, luxury hotels and lots of sunbathing tourists. While I was there I decided to try my hand at surfing and signed up for an hour lesson. It was much harder than I thought it would be, but much more exciting than I thought as well. After my hour session, my friends and I were hooked. Wanting to fulfill our surfing crave we hoped on the bus and took the couple hour drive up to the North Shore to watch a big wave surf competition. 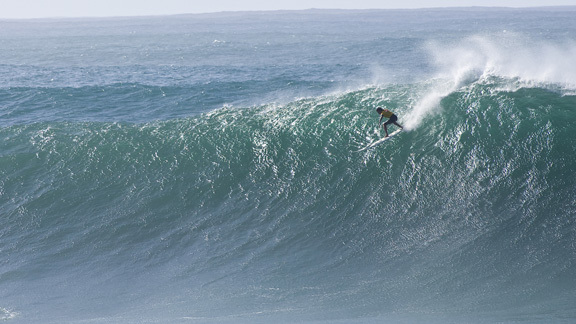 By chance, when we were there, the Eddie Aikau big wave surf competition was happening. This competition rarely happens, about once every 40 years. The waves are ridiculous, reaching about 45 feet. And the surfers are even more ridiculous. Although its was obviously just by chance that we were there when this competition was happening, surfers are always out on the North Shore doing their thing. I would highly recommend anyone who visits Hawaii taking a day trip away from Waikiki and visiting the North Shore beaches.